Apologies for the slowness on my end - I returned home from my travels to one sick kid, a sick husband, and broken laptop. So I'm slapping a bandaid on things to do and muddling through. Awesome time in Michigan with my family though. Bob is back with your Week 2 Streaming Defense thoughts and I'll have more posts out your way soon! The first week of Fantasy Football is in the books with the results. How did you do on your Def picks? 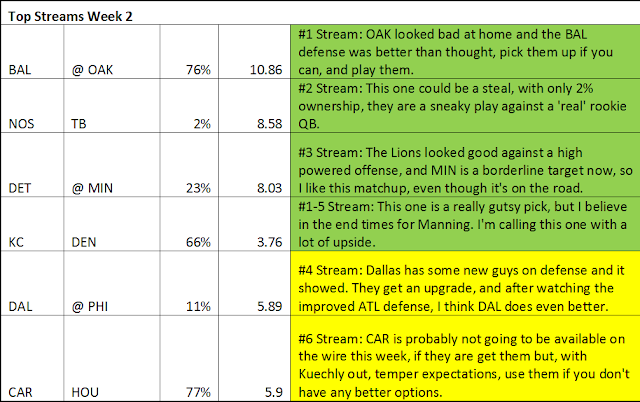 It was a good week for streaming Defs and I hope you benefited from some starts on Def. Below are the results using MFL stats and Fantasy Sharks scoring. Suggested streams are outlined in Green. Owned and started are in Blue for start, Yellow for temper expectations and Red for look elsewhere. 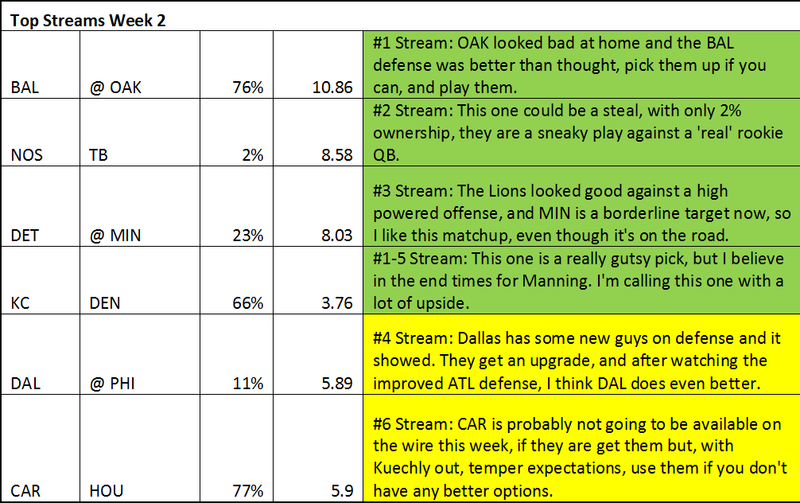 As you can see four of the six suggested streamers outperformed all but Sea of the owned Defs. Panthers were the number one pick and ended up number one over all. Ten did better than TB and ended up fourth. Rams and Bills still ended up in the top 12 even with tempered expectations. And I warned you about PHI and HOU. So what did we learn? How about our targets? The Titans are off the list of targets. TEN’s new QB is not going to be the patsy we may have thought. Mariota came out throwing short, early, and often and torched the TB defense. Didn’t see that coming, but we can change our expectations going forward. The Jags didn’t disappoint, and will stay the leading target going forward. WAS is also firmly acknowledged as a good target. Foles surprised us and so did the rest of the Rams offense. Even though they gave up 21 points to SEA defense, they are not expected to do that with lesser defenses, so they’re off the list. TB stays on the list until the rookie can prove otherwise, like Mariota did. So did other targets emerge? It’s only one week, but you’ve got to suspect, dare I say it? The Broncos did not look good (FFLibrarian editorial note: noooooo!). 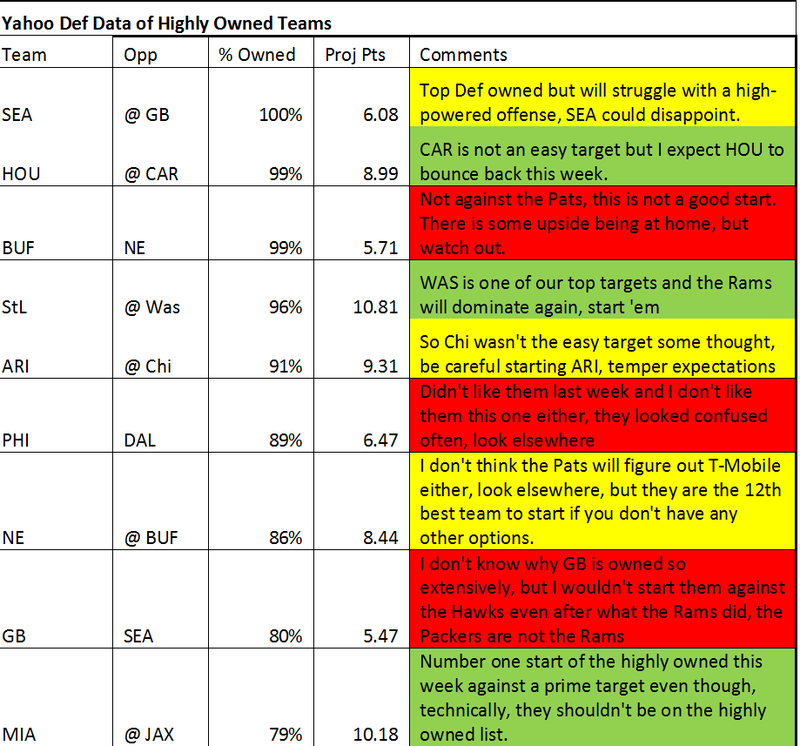 The Ravens were not projected to be a good defense, ranked 14th in cheatsheets, but they put it on DEN even in a loss. I’m thinking DEN is going to have a bad year with a marked decline in Manning magic, so I’m putting them on my ‘watch list’ as a target. The 49ers were supposed to be decimated in Def ranked 16th, but they destroyed MIN. Bridgewater looked like a sophomore slump, so MIN also goes on my ‘watch list’. And OAK looked bad with both Carr and McGloin. CIN was only ranked 15th but put it on the flaying OAK offenses. So OAK goes on my ‘watch list’. Here are the ownership % and projections for Defs this week of the ‘owned’ defenses. Owned being better than 80%. So here are the top streams to fill in those blanks above. I noticed that you are not recommending MIA @ JAX. Too obvious, or am I missing something? Also, what about the Suggs injury?